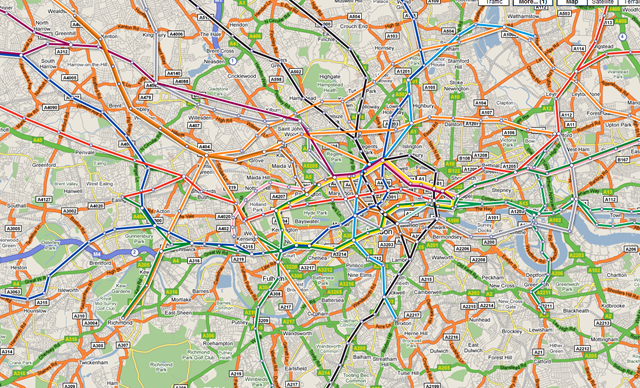 This is quite a cool idea, a 3rd party has created a Google Maps overlay for public transport for many major cities. I live in London and this is especially useful as a visual aid to getting about (although I do know my way around pretty well) as you can see the mix of tube routes overlaid onto the streets – as almost all trips will be a tube/walking combination it gives a quick way to visualise where you are going. Would be especially useful if this would work with the Blackberry Google Maps application that I use all the time but I can’t see a way to do that, overground rail networks and maybe bus routes would also be useful – but that would need a bit of detailed input from TfL (Transport for London) I would guess.